The politics behind the meeting of Kirill and Francis in Havana will only intensify as this summer’s Pan-Orthodox Council in Crete draws near. It seems that Cuba and Crete, two islands as remote from each other as can be, both geographically and culturally, have recently become connected by an invisible thread. 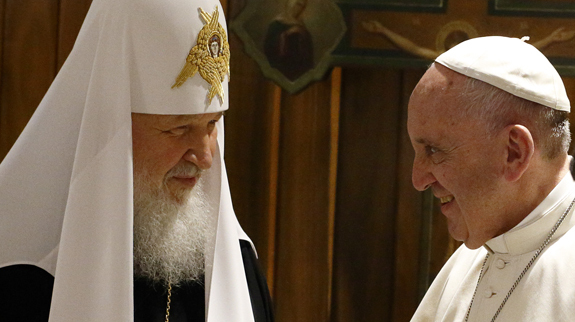 One hosted a surprise meeting between Pope Francis with Patriarch of Moscow Kirill. The other is to host the Pan-Orthodox Council in June, an event that has been in preparation since the 1960s. Apart from the common pioneering character of these two events, there are other connections between them. It has been repeated several times that the meeting in Havana, in addition to its ecumenical appearance, had many non-theological and even non-ecclesial subtexts. Among other rationales, it was supposed to enhance the positions of the Russian delegation at the All-Orthodox meeting in Crete. Indeed, it has become a commonplace notion that the relations of the local Orthodox Churches are framed by the antagonism of two of them, Constantinople and Moscow, which goes back to the period of the Cold War. Such antagonism is not unusual in the Christian world: in different historical periods it existed between Alexandria and Constantinople, Constantinople and Rome, and now Moscow and Constantinople. This last one, however, is not as old as the previous ones and, hopefully, will not lead to the same consequences: the great schisms between the Oriental, Byzantine, and Latin Churches. Since then, the Orthodox Churches in their policies have often embarked on political patterns that are often poorly understood and clumsily implemented. The Churches may deny this and assure everyone that their policies stem exclusively from the divine Revelation, but history indicates otherwise. For instance, the modern idea of autocephaly (i.e., “self-government”) is closer to modern political theories of the sovereignty of states than to the original concept promulgated by the Ecumenical Council of Ephesus (431). The present dominant attitude of the Orthodox Churches to their “diaspora” Churches more closely resembles the principles of colonial thinking than it does with Orthodox canon law. Geopolitical rather than Gospel thinking makes the Orthodox Churches keep silent about the outrageous war in Ukraine, where the Orthodox kill other Orthodox. In this vein one may understand the antagonism between Moscow and Constantinople today. Surprisingly, it is relatively new. It did not exist in the 19th century, when the Russian Church, for instance, supported the Church of Constantinople in its struggle over the independence of the Church of Greece. It was exacerbated, however, after World War II, when the Moscow Patriarchate allowed itself to be used by the Soviet state for pursuing post-Yalta politics in the freshly cut pieces of the Middle East and Eastern Europe. The wrestling between the two Churches has not disappeared since the post-WWII era, and it has been accelerated by the policies of isolationism and anti-westernism on the part of the current Russian government. This geopolitical thinking inspires some Churches to imagine the Pan-Orthodox meeting as an opportunity for pursuing their political agendas. These agendas have already moved the location of the Council from Istanbul (the home of the Ecumenical Patriarch) to Crete, giving as a reason the downing of the Russian military airplane by Turkish air forces. The same political imagination made Cuba Moscow’s choice for the site of a meeting with Pope Francis. The Patriarchate of Constantinople, in the imagination of Moscow, not only stands for Turkey—even though, in reality, the Patriarchate and the Turkish government have a long record of harsh relations—but is also an ally and proxy of the United States. Indeed, the meeting in Cuba will make the positions of Moscow at the Pan-Orthodox gathering in Crete even stronger. If Rome had insisted that the meeting should take place after, not before, Crete, this have would minimized the embarrassment for Constantinople and would not have insulted the relations between the Holy See and the Ecumenical Patriarchate. Since the historic meeting of Pope Paul VI with Ecumenical Patriarch Athenagoras in 1965, the relations between the two Churches have been cordial and intense. Constantinople, however, had to pay for them. This Church was often criticized by conservative and ultra-conservatives of the Greek and other Orthodox Churches for its special relations with Rome. Good relations with Rome demanded Constantinople to sacrifice a lot. Rome, in the way it was led to the meeting in Havana, struck a blow to those good relations. It also struck a painful blow to Ukrainian Greek Catholics, who both officially and unofficially objected to the highly political paragraph on the Ukrainian conflict in the Joint Declaration of Francis and Kirill. Ukraine and Constantinople became victims of the way in which the Havana meeting was handled. It seems that Rome is not the only one who will have to pay for the Havana meeting; it will be expensive for Moscow, too. For many years, Moscow’s excuse not to meet the pope was the argument that such a meeting would be opposed by the Ukrainian Orthodox Churches, still angered by the reemergence in the early 1990s of the Ukrainian Greek Catholic Church, which is in union with Rome. As it turns out, there are no such objections recorded so far. There are, however, voices among the Orthodox objecting to the participation of the top hierarch of the Ukrainian Orthodox Church (Moscow Patriarchate) in the meeting, which produced a declaration that is deemed anti-Ukrainian by many. What this means is that the “existence of the Greek Catholic Church” argument against a meeting with the pope was merely an instrument of propaganda and not a genuine reason for refusing to meet. Moscow’s real fear was that radical conservative groups within the Russian Church would object to any encounter of the Russian Orthodox Primate with the pope. This fear turned out to be well founded. Immediately after the Havana meeting, the fundamentalist voices against it rose loudly. All sorts of conservatives, from mild to hard, started expressing their dissatisfaction. Here are only three examples. A lecturer at the prestigious Moscow State Institute of International Relations, Olga Chetverikova, called the Patriarch “a heretic” and urged the Christians to choose between him and Christ. A priest of the Moscow Patriarchate, Dmitri Nenarokov, has called the meeting in Havana a “new milestone in the history of the apocalyptic processes.” Twelve priests and two monasteries from the jurisdiction of the Moscow Patriarchate in Moldova have ceased commemorating the Patriarch because of the Havana meeting. The same kind of objections have been uttered against the upcoming Pan-Orthodox Council in Crete, for the same reason: an alleged compromise regarding the purity of the Orthodox faith. Thus, the Primate of the Ukrainian Orthodox Church (Moscow Patriarchate), Metropolitan Onufry, openly criticized the Council, which he called “a temptation.” Later on, after he attended the January 2016 Synaxis of the Orthodox Primates in Chambésy, he changed his mind. Many of his followers, however, did not. The two “compromising” events, the meeting in Cuba and the Council in Crete, will have a cumulative effect of further angering radical conservatives. Every Church has such folks. However, some Churches try to tackle radical conservatism, and some yield to it. Patriarch Kirill, who never sincerely sympathized with this phenomenon, decided to instrumentalize it. In Russia (and not only there), the radical conservatives are in favor of Mr. Putin. In Ukraine, they are against independence of the Ukrainian Orthodox Church and against Ukraine as an independent state. They thus became useful for the Church in Russia to pursue two tasks: legitimization of the current political regime in the Kremlin, and undermining the independence and pro-western orientation of Ukraine. For these purposes, the Russian Church decided to support the radical conservative movement and effectively lead it. Now, after the Havana meeting and leading up to the Crete council, the radical conservatives seem to be firing back. Some of the subscribers to the “Russian world” concept, who had fought in the east of Ukraine, inspired by the idea of a holy mission, seem to be dissatisfied with the recent ecumenical initiatives of the Russian Primate. They are like a genie released from the bottle, and are now turning against Aladdin.